A tiny suit of sailor clothes in the Museum’s collection tells a lucky story of survival. The duck frock and trousers, both carefully decorated with embroidery and piping, belonged to John Thomas Jefferson. 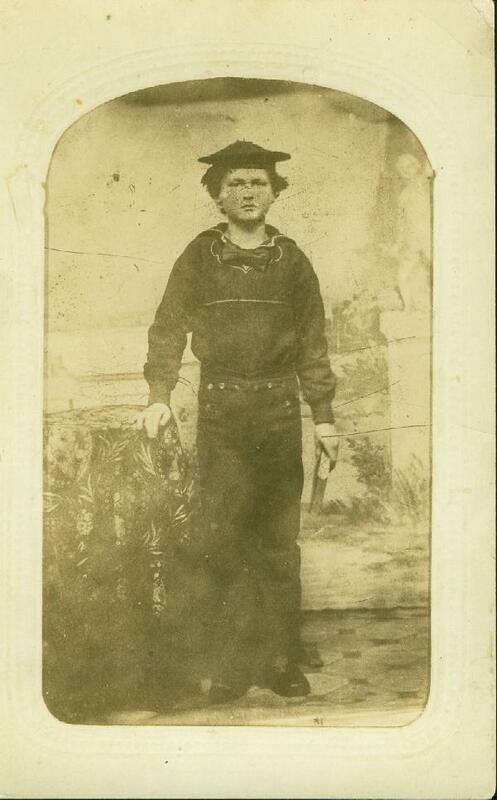 In 1867, when he was scarcely 12 years old, he enlisted in the US Navy. A boy in both rank and age, he joined Constitution’s crew in July. By then, the venerable old warship served as a floating classroom at the Naval Academy in Annapolis. Jefferson’s duties were light and it seems he was frequently detached to serve on the Albemarle, Admiral Porter’s pretty little steam launch. It was the same launch that Lt. William Barker Cushing had used to blow up the Confederate ironclad Albemarle during the Civil War, and it was now the old admiral’s personal plaything. On October 19, 1867, Porter and his friend Capt. Lewis decided they wanted to go for a cruise, but “concluded first to go on board of the Constitution and observe [the Albemarle’s] rate of speed before starting on the trip.” Twice the launch steamed by at 11 knots, but as she returned to take the officers on board, the boilers suddenly exploded. John T. Jefferson in 1868, wearing his dress blues and holding an unsailorlike accessory- a book! USS Constitution Museum collection. Wearing his best warm-weather frock and trousers in honor of the admiral’s visit, little John T. Jefferson was blown overboard, together with several of his shipmates. He survived, but his suit bears witness to the disaster. Though torn and stained with his blood, the young sailor kept the clothes for the rest of his long life. In 1931, when the newly-restored Constitution visited Annapolis during her three-coast tour of the nation, Jefferson lent it to a “main street merchant” who displayed it in his window. The merchant “had quite a history of the suit printed and placed near it.” As the old sailor related in a 1933 letter to his daughter, “I am sometimes asked by friends to see it even now at this late date.” He died three years later at the age of 81. J.T. Jefferson’s frock and trousers. USS Constitution Museum collection. The Museum acquired the diminutive clothing in 1974, but because of the degradation of the fabric (it was, after all, displayed in a shop window for years and otherwise much loved), it has not been on public view for decades. As early as the War of 1812, US Navy sailors wore white frocks with blue collars. In 1815 Boston Navy Agent Amos Binney sought “five hundred cotton Frocks, one yard long from the collar, the collar, cuffs, and bosoms lined with blue nankin [nankeen, a plain-woven cotton].” Although there are no images of American navy frocks during the war, the description offered by Binney sounds very much like the decorated frocks worn with increasing frequency in the 1830s and 1840s. It is possible that this fashion was retained for thirty years afterward, not so much because slop clothing tended to be conservative in cut, but rather in honor of the 1812 generation. 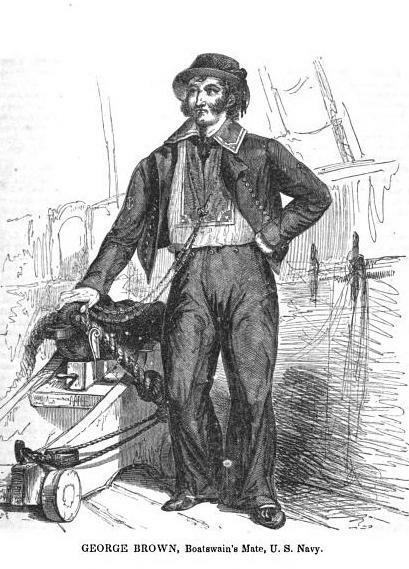 That frocks were frequently decorated in some manner can be seen from an 1816 navy clothing contract proposal, in which a potential supplier promises “Duck Shirts if Made Plain, that is without any ornamental trimmings or work, [for] one dollar and fifty cents.” British deserter Samuel Leech, serving on USS Siren in 1813, remembered, “I … adopted that peculiarity of dress practiced by American men-of-war’s men, which consisted in wearing my shirt open at the neck, with the corners thrown back. On these corners a device was wrought, consisting of the stars of the American flag, with the British flag underneath.” The garment Leech describes is not a “body shirt,” but rather a frock embroidered by the crew. Jefferson followed the old sailor tradition by embellishing his clothing with embroidery. A narrow, naturalistic vine of foliage follows the trousers’ fall, or front flap. Contrasting white stitching decorates the frock’s blue scalloped cuffs. Wavy white cotton gimp outlines the bottom edge of the cuffs and the edges of the neck, while two white embroidered stars complete the collar. Incidentally, there persists a legend that the three rows of white tape on the modern navy dress jumper is a reference to British Admiral Lord Horatio Nelson’s three great victories, and that the black neckerchief is a symbol of mourning for his death at the Battle of Trafalgar in 1805 . Unfortunately, this theory is not substantiated by any historical record, nor is there any good reason why the US Navy should commemorate the successes of a British admiral. The white tape on the blue flap is simply decorative, and seamen have worn black silk neckerchiefs for centuries, black being a perfect color to hide grime.